Tom P: My first Avengers comic didn't even have the team name in the title! That would have to wait until New Avengers #1 a few years later. Let's face it, you can call a shovel a spade all you want but as far as I'm concerned The Ultimates is the definitive Avengers comic. Released in 2002, it was so popular many speculated that the newly formed 'Ultimate Universe' would replace Marvel's existing 616 Universe. That didn't happen though, as the Ultimate Universe flagged after multiple relaunches, and it now looks set to implode soon, killed off by Jonathan Hickman and his work - ironically - on the current Avengers and New Avengers titles. 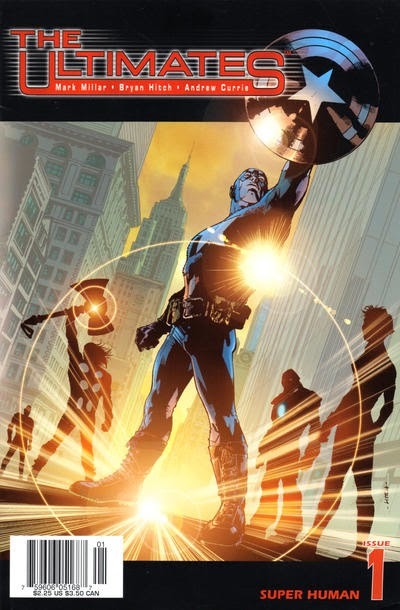 The first issue is notable for featuring only one familiar character for the most part: Captain America. We hit the ground running with Cap leading an assault on a secret alien Nazi base in Iceland. We're introduced to him in silhouette as the troops talk amongst themselves: is he a super soldier or a clown in a costume cooked up by the recruitment people? A grunt asks "How's he going to help us on the ground when he ain't even wearing a parachute?" (in a scene later referenced in Captain America: The Winter Soldier). He gets his reply: "Parachutes are for girls." So starts an epic action setpiece as Cap and the troops storm the beach - Saving Private Ryan meets superhero blockbuster action. Artist Bryan Hitch combines these to create an intensely cinematic opening which would become the hallmark of the series. Captain America reaches the prototype hydrogen bomb heading for Washington, jumps onboard and detonates the rocket mid-flight with a hand grenade. It ends with him crashing and floating down into the cold depths of the Atlantic Ocean to be frozen, as is always Steve Rogers' fate. Fast forward to Everest in 2002 and we get a brief glimpse of Tony Stark about to return to New York, his mind clear and ready to join Nick Fury's The Ultimates. Pure spectacle backed up by a razor sharp script from Mark Millar. I reread this issue to refresh myself for this article, even though I pick The Ultimates omnibus from my shelf at least once every year, and for me it's lost none of its verve. I'm a shameless fan of the run and believe it highly impacted the whole of Marvel. The omnibus edition even has a forward by future The Avengers director Joss Whedon. This book changed the game and showed us what cinema could do with these characters. Mark Millar has since gone on to show how adept he is at getting his projects to the big screen - would we have been gearing up to watch Avengers: Age of Ultron without The Ultimates? Just as Frank Miller gave us the modern Batman, I genuinely believe Millar and Hitch redefined the Avengers for a generation of fans old and new, starting here. I agree. The Millar run on the Ultimates is to my mind the greatest series of Avengers comics I've ever read. It does rank up there with Watchmen and Dark Knight and it would be one of the first superhero comics I'd reach for if I ever wanted to convince someone new to comics that superhero comics can be 'literature'. A real shame there was never a Millar and Hitch book 3.